Prior to the economic crisis and the recession that followed, the U.S. real estate market was dominated by office property sales, with apartment property sales well behind. That changed in the following years as apartment sales roared out of the recovery thanks to strong fundamentals. It is more demographics than downsizing powering the apartment market. Jay Parsons, director of analytics and forecasts, MPF research at RealPage Inc., told attendees of the Canadian Apartment Symposium Series in Toronto this week that the U.S. is seeing its highest growth rate in 20- and 30-somethings since the post-WWII baby boom, and expects that to continue through the next decade. In a recent article, he quoted a Pew Research Center estimate that found there were 21.6 million young adults (18- to 31-year-olds) living in their parents’ homes in 2012, up by 3.1 million from 2007. If they ever get out of the basement or spare bedroom, they are likely headed to an apartment. The housing crisis that turned into a foreclosure crisis also turned single-family homeowners into single-family apartment dwellers. Millennials, whether at Mom and Dad’s or not, have delayed buying homes as they waited longer to get married and have children. That’s not a recipe for homebuying, but it provides great impetus for renting, said Parsons. That’s reflected in the share of commercial transactions for multi-res in the U.S. Traditionally, it is around 25 per cent of all commercial real estate deals, but more recently it is hovering near the 30% range, a function of investor demand for an asset class increasingly viewed as a safe haven. In 2014, the dollar value of apartment transactions was higher than even at the height of the previous cycle (2007). “The recession really taught American investors a lesson about the stability of the apartment business because one of the nice things about the apartment business,” he said, “(is that) even during a recession, you may see occupancy drop off a little bit but even a poorly run apartment property is only going to be eight to 10% vacant. Post-crash America has also been characterized by apartment development rather than condo development. With the housing crash still fresh for many investors, talk of a potential bubble in the apartment sector is pervasive, said Parsons. He, for one, is not overly worried about a big hole being blown in the market any time soon even though prices are high and builders are busy adding new stock. The risk of higher interest rates remains a constant threat, but as he noted, most prognosticators have been predicting higher rates and have been consistently wrong. The most recent consensus among experts was that rates will begin to rise by this summer in the U.S. but even that time frame has been pushed back. “We should probably just learn to stop forecasting interest rates; they are really hard to figure out,” Parsons said. That money, coming out of Asia, the Middle East and Europe, is ending up primarily in U.S. core markets and apartments, driving up pricing and driving down cap rates. 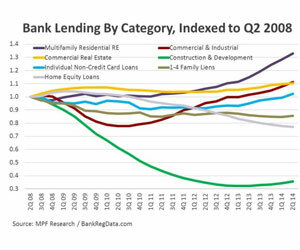 The belief in apartments as “one of the safest bets to be made at this point in the market” is also shared by U.S. banks which doled out more debt for multi-family. The sector’s share as a total debt on the banks’ books is the highest on record since the Federal Deposit Insurance Corporation (FDIC) began keeping track in the early Nineties. Crunching the data, Parsons observed that even with all the apartment building activity south of the border, the U.S. still lags the construction frenzy in Canada on a per-capita basis. North of the border, however, the multi-unit housing boom is in condos. “The condo development pace here and on a per-capita basis and even accounting for the population growth in Canada . . . you are building far more condos than the United States is building apartments,” he said. He said in Canada there is one new condo unit built for every 10 new residents that come to the country, about double the comparable rate of U.S. apartment construction for new residents. For fun, Parsons threw up the Greater Toronto Area on the U.S. chart of major metropolitan markets for multi-res housing and household formation. What did it show? The GTA clocks in at an eight per cent rate for annual household formation over the past five years, putting it in the top 20 percentile of the U.S. markets in terms of household formation, comparable with cities such as Seattle. That would translate into four to eight per cent inventory growth over the last five years – provided developers were building apartments rather than condos. In reality, apartment growth has been closer to one per cent, he said. If that condo boom had instead been in apartments, Parsons said the 5,000 to 6,000 for-rent units built over the last five years instead would have been about 27,000 apartment units.